Updated: Skratchworx has a great write-up on the Controller One as well as other neat new PLASA gear. See an in-action video there. Worth buying on its own for music? Naw. But an interesting extra on an otherwise great table. Turntables can slice, chop, juggle, scratch, and make all manner of noise. They can work as MIDI controllers for other instruments, control vibrating chairs, and run interactive art installations. The one thing they can’t do: play musical notes like a flute or piano. And in a daring move to solve something no one had previously seen as a problem, Vestax is building a turntable to do just that. Via a row of buttons and a fader or foot pedal. I think. Sound: A standard audio record is the sound source; apparently the idea is you use a single-note album (note C) and then bend it up or down. 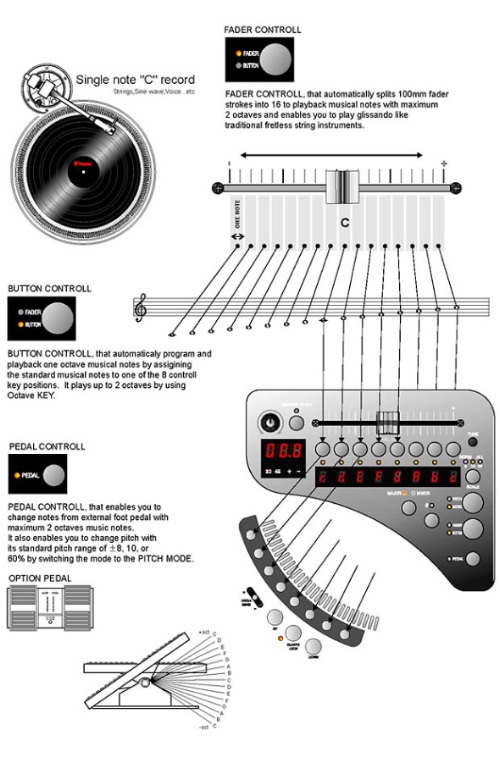 “Voice, strings, sine wave” are among the ideas in the diagram, but — uh — is Vestax going to sell an enitre record of a sine wave? Individual notes: In one of the worst keyboard interfaces ever, you use a series of buttons to choose pitches. Octaves and Glissando: The fader can be switched to adjust either octaves for the buttons or bend between notes. You can also use a foot pedal for pitch bend. Confusion, thy name is Controller One. This appears to be a direct drive machine, so you can . . . scratch . . . your . . . one note. Is everyone else as baffled by this as I am? It’s like the world’s worst sampler: you’ve got a single playback source, buttons and faders for controlling pitch, and apparently no way of controlling volume or expression. The greatest thing about a turntable is, well, the turntable — the ability to scratch this tactile, rotating disc. Yet the primary interface here appears to be a cheap row of buttons. 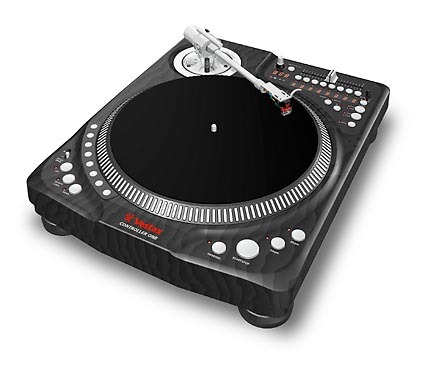 This makes a little more sense if you look at it a different way: since it’s a standard turntable, you could presumably repitch any record (found sounds, voice, whatever) using the buttons and foot pedal, so you could play any record according to musical pitch just by modulating speed. If you’re good with your feet, you could repitch with the foot pedal while scratching with your hands. Now that’s cool — totally bizarre, but cool. If you can in fact control this with MIDI, I can even envision a chorus of these turntables, directed by laptop, singing in surreal harmony. I may be missing something major here, though, so I’m going to go talk to Vestax and try to find out what the heck this is. It’s a real product; it’s in the new products section of the Japanese Website. In the meantime, you can puzzle over this diagram. Now if I could just brush up my Japanese, I could get a gig in Tokyo as a copy editor, but you get the idea. Oh, by the way, you don’t actually need to fly to Tokyo to buy a new Controller One to do what I’m describing — you could just use a control record and software and get the same effect. Remap pitch in the software (especially if you’re using something like Ms. Pinky and Max/MSP, for you fellow avant-garde interactive geeks out there) and assign speed to a MIDI controller. Done. DJDeals.com has a photo of the unit on display. They hopefully suggest that “This will certainly move the dj and turntablist further towards acceptance as a true musician as it allows the turntable to become a true musical instrument rather than just a tool for playback.” Except, of course, this still is a playback tool — just with a really complex pitch control. GearJunkies is on top of things as always, though their Babelfish translation doesn’t help a whole lot.